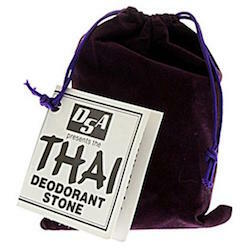 Deodorant Stones of America - Thai Crystal Deodorant Stone with Velvet Bag 5.5 oz. Deodorant Stones of America Thai Crystal Stone with Velvet Bag 5.5 oz. The grand daddy of all deodorant stones. This all natural stone is hand shaped and smoothed and will provide round the clock protection. Lasts over 1 year. Just moisten the stone and apply to underarm. Cover the area generously. The stone works by eliminating bacteria growth which is the cause of body odor. Works for foot odor too. Ingredients: Mineral salts, potassium alum, calcium, sodium, zinc, phosphorus. Hand shaped and smoothed. Around the clock protection.